Richard's Page: Barrow - Part 3 of ?? The weather forecast promised some sunny weather so I headed back out to the BEO Control Shed late morning. At the time, I wasn't too sure as snow was blowing around. But by the time I was ready to head back the sun had come out (sort of). It was a pretty nice walk out and back but I am exhausted right now. The snow was soft and it feels like you are walking through sand. I liked the way the snow was peeling off of the side of the building. 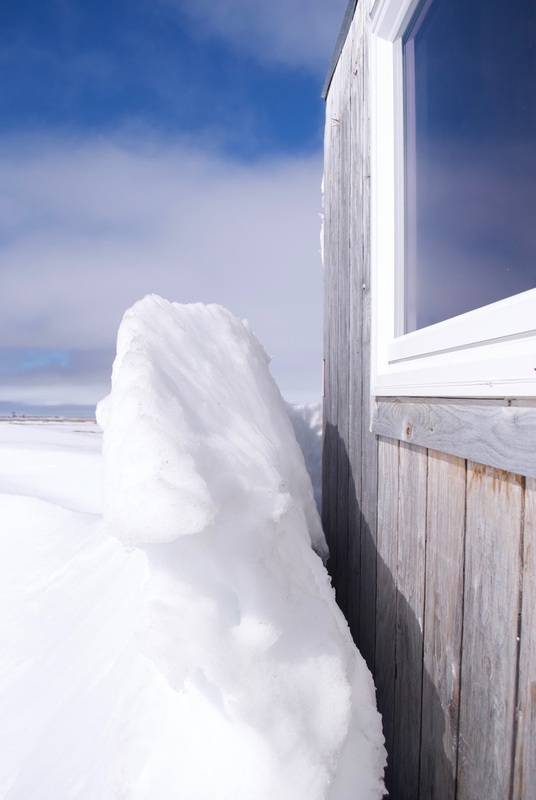 Last week, this window was almost completely covered with snow. 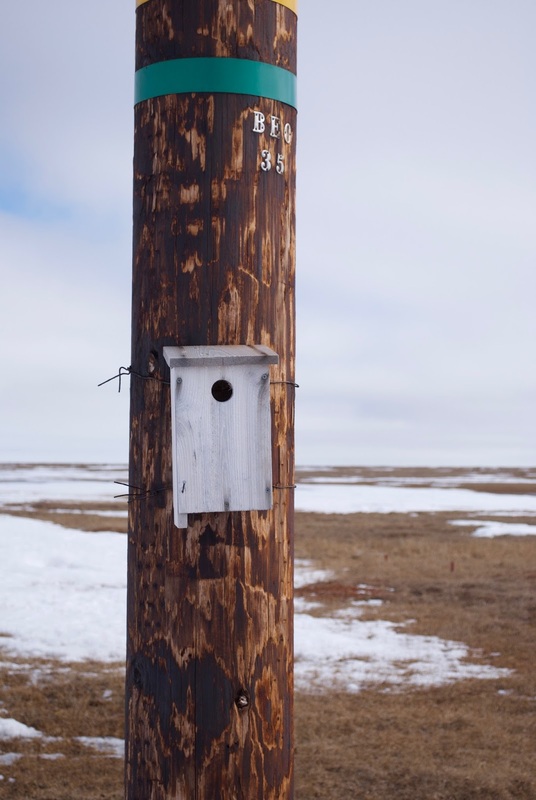 Quite a few of the power poles have these small bird houses. None appeared to be occupied. The only birds I've been seeing around here have been geese. So I'm not sure what kind of birds these houses are for. Hopefully, something that feeds on mosquitoes. With all of the water around here, it must be a great breeding ground for mosquitoes. This is just some typical scenery during the walk. Actually, I just needed an excuse to stop and pulling out the camera seemed to be convenient. At this point I'm about ½ way between the road and the Control Shed. What it does show is how much water is actually out here. No drought here... Or pollen. And no weird food pics either. No mosquitoes yet. I've never been out here during the summer but from what I hear, the mosquitoes can get pretty bad. But every day has been pretty windy. If it's that way during the summer it'll keep the mosquitoes grounded. 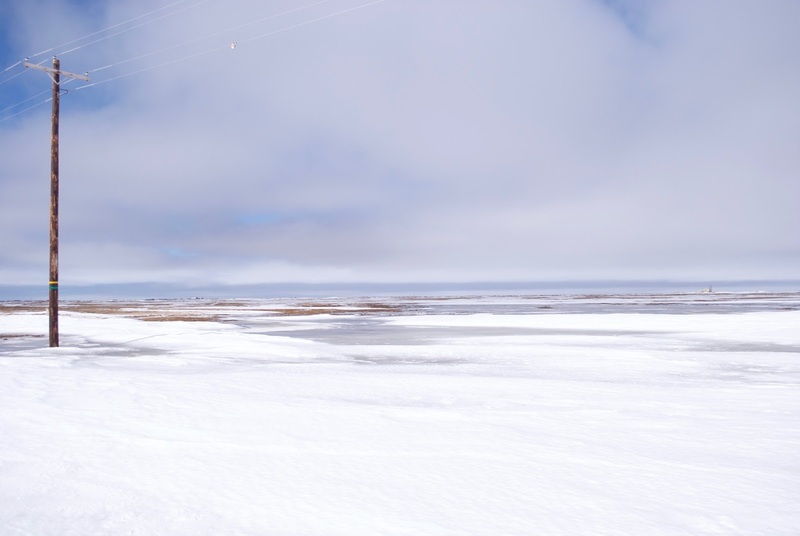 The color contrast with the snow and that color of blue sky/cloud mixture is pretty. Wonder how much pollen you'll see when you get home? Hope it has settled down and Bridget is feeling better with it all. I really like the color contrast. Kinda like blue/white motorcycles, eh? From what I've read the amount of pollen has set records this year. And even people that aren't normally affected have been feeling it. Yesterday, I was talking to an archeologist up here who said that several people have been getting watery eyes and sneezing up here. They were wondering if the wind would carry the pollen that far. The last pic looks like a painting. I kinda like it in spite of the snow. There are obviously two distinct seasons over there: Winter and mosquito season... I remember the same saying from my Manitoba experience.